Teeth play a very important role – they help us to chew our food and form words. You probably don’t think about how valuable they are on a daily basis, but you’d surely know if all of a sudden they were gone! Those Cute Little Baby Teeth! Primary teeth, or baby teeth as they’re commonly called, generally begin to come in when a baby is about six months of age, although there have been reports of babies who were actually born with teeth! 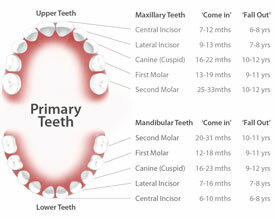 By the time a child is two and a half years old, he or she usually has all 20 primary teeth. And… barring any accidents or injuries, they will remain in the child’s mouth until he or she is approximately six years old. That’s when they start to fall out and are replaced by permanent teeth, also called adult teeth, which if cared for properly should last them a lifetime! 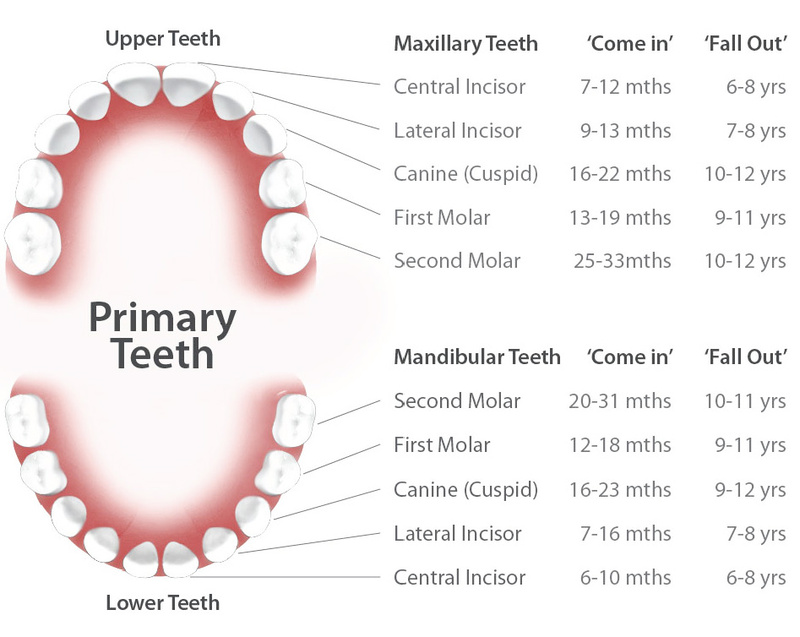 Permanent Teeth – Hopefully Here to Stay! 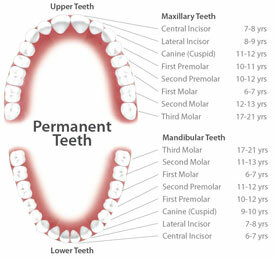 Permanent teeth continue to replace primary teeth as they fall out, and 12 more are added for a total of 32 permanent teeth, which usually have all erupted between the ages of 18-25. The last teeth to erupt are called Wisdom Teeth, so named because it was assumed that you are older and wiser when you finally get them! Many question their value, since they usually get impacted, below the gums or grow in on an angle, crowding or in some way upsetting their neighboring teeth, which calls for their prompt extraction! Canines – also called cuspids, are the individual teeth right next to the incisors; the four of them are used for tearing. Pre-molars and Molars – are used to grind food small enough to swallow. 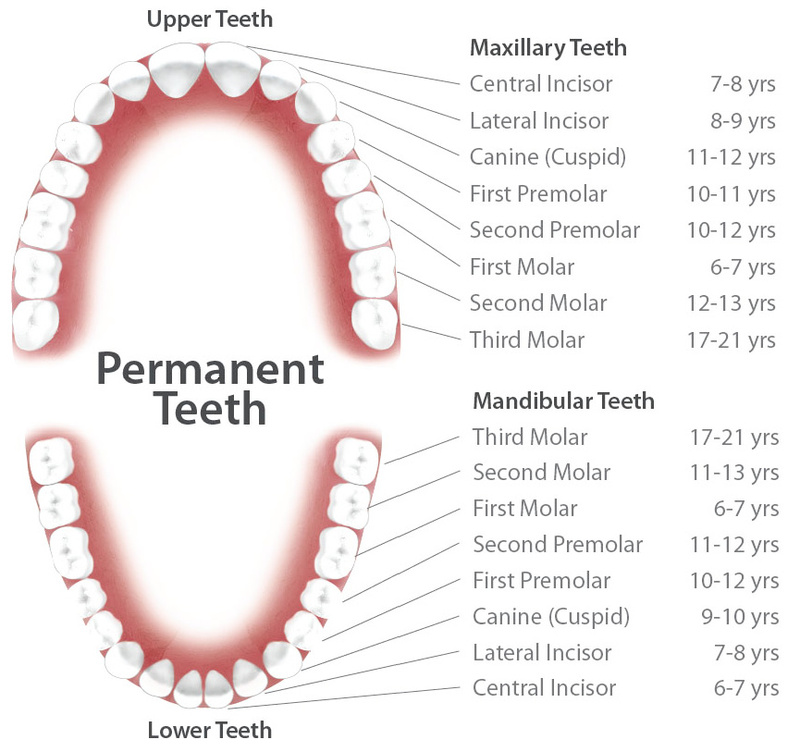 Children have four molars on the top and bottom (8 total); adults have 10 molars on the top and bottom (20 total, including Wisdom teeth). So many teeth for so many jobs! What happens when one or more of them are decayed or diseased? You need to get them back into “working” order as soon as possible! For an appointment to examine whether your teeth are able to do each of their jobs, call Douglas E. Oliver, DDS – we can “fine tune” even the most problematic teeth!